U.S. stocks finished the holiday-shortened trading week modestly lower, as Wall Street investors remained cautious ahead of a possible North Korean ballistic missile test and the weekend arrival of Hurricane Irma in southern Florida. Energy and technology companies tumbled on Friday. Meanwhile, telecom, banks and insurance firms led losses for the week and bond yields fell to the lowest levels this year on safer-haven asset buying and speculation the Federal Reserve may delay raising interest rates this month. Equities received a mid-week respite when President Trump crossed the aisle to strike a deal with Democrat Congressional leaders to temporarily extend the federal debt ceiling through December 8th. For the week, the S&P 500 fell -0.58%, the Dow Industrials lost -0.86% and the MSCI EAFE (developed international) gained +0.83%. With any natural disaster, it is important to separate human tragedy from economic impact. That said, while natural disasters tend to coincide with short-term economic weakness, history suggests that economies are, for the most part, able to rebound over the medium term. 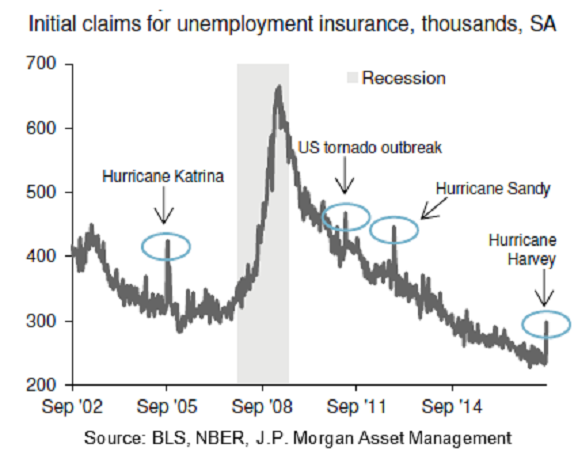 As shown in Chart 1, the U.S. has seen four major natural disasters over the past 15 years, each of which led to a significant spike in jobless claims in the immediate aftermath. However, in each instance, these dislocations were limited to the affected region and did not meaningfully impact the longer-term economic trend.. While refinery disruptions have boosted gasoline prices and could hurt the consumer, insurance payments to replace destroyed vehicles could have the opposite effect. Either way, according to J.P. Morgan, the economic impact should be temporary. Moreover, events such as Hurricanes Harvey and Irma serve as a reminder of why portfolio diversification is so critical – by having some assets that zig when other assets zag, it is possible to create a smoother, less volatile portfolio.